SS 316LN Tubes, 316LN Stainless Steel Pipes, SS UNS S31653 Pipes, ASTM A312 Stainless Steel WNR 1.4429 Seamless Pipes & Welded Tubes Supplier & Exporter in India. Stainless steel grade 316LN is an austenitic type of steel that is a low carbon, nitrogen-enhanced version of grade 316 steel. The nitrogen content in this steel provides solid solution hardening, and raises its minimum specified yield strength. It also possesses good resistance to general corrosion and pitting/crevice corrosion. 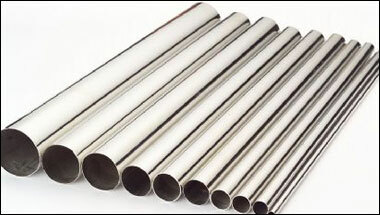 We are offering different kinds and varieties of Stainless Steel 316 LN Pipes & Tubes that are made using effective technology and high-tech machineries. These 316LN pipes & tubes continuously tested on different quality standards and available various forms like ROUND, SQUARE, RECTANGULAR, COIL and 'U' Shape, SEAMLESS, ERW, WELDED and FABRICATED forms. These 316LN stainless steel pipes & tubes are used in oil & gas, LNG, Thermal & Nuclear Power Plants, Chemical Industries, Fertilizers Plants, (petro) chemical, shipbuilding, desalination, water treatment, energy industries, EPC and Pipes for General Engineering Purpose. Our product includes tubes and pipes, SS 316LN Pipes, SS 316LN Tubes, Stainless 316LN Seamless Pipes & Tubes etc. These products are available at best possible prices which is another important feature exhibited by our products range. Stainless Steel 316LN ERW Pipes, SS 316LN Seamless Tubes, Steel 316LN Welded Pipes, Stainless Steel 316LN EFW Tubes, Stainless ASTM A213 316LN Seamless Pipes Manufacturer in India. South Africa, Houston, Sudan, Africa, Saudi Arabia, Algeria, UAE, Turkey, Ethiopa, Democratic Republic of the Congo, Italy, Azerbaijan, Egypt, Venezuela, Mexico, Germany, Cameroon, Trinidad and Tobago, Israel, Peru, UK, Colombia, Kuwait, United States, Russia, Uganda, New Zealand, Canada, Brazil, Iran, Vietnam, Tunisia, Dubai, Bahrain, Australia, London, Indonesia, Ghana, Morocco, Mozambique, Argentina, Malaysia, Nigeria, Angola, Iraq, Sri Lanka, Thailand (Bangkok), Chine, Kazakhstan, Jordan. Rabat, Beirut, Kaduna, Kano, Khartoum, Zaria, Casablanca, Abidjan, Cairo, Maiduguri, Manama, Freetown, Hong Kong, Kinshasa, Tel Aviv, Doha, Fez, Algiers, Istanbul, Dubai, Aqaba, Tehran, Dar es Salaam, Conakry, Cape Town, Jerusalem, Colombo, Abu Dhabi, Antananarivo, Mecca, Mbuji-Mayi, Tripoli, Accra, Port Elizabeth, Muscat, Lagos, Bethlehem, Johannesburg, Amman, Bamako, Sharm el-Sheikh, Soweto, Yaoundé, Benin, Durban, Alexandria, Cairo, Ouagadougou, Port Harcourt, Singapore, Luanda, Lubumbashi, Jeddah, Data from the UN, Pretoria, Kampala, Ibadan, Brazzaville, Addis Ababa, Riyadh, Harare, Lusaka, Byblos, Bulawayo, Subra al-Haymah, New York, Dammam, Maputo, Omdurman, Nairobi, Giza, Mogadishu, Douala, Kolwezi, Dakar.